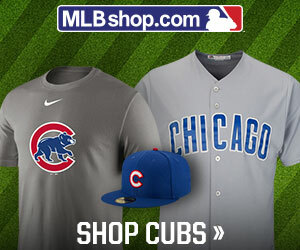 Are you Cubsessed with the Chicago Cubs? Welcome to iamcubsessed. My name is Seth Thomas. I have been Cubsessed with the Chicago Cubs since birth. I assume similar to most Cubsessed Chicago Cubs fans. I am a third generation Cubs fan that is grateful to have been able to attend many exciting baseball games and other exciting events at and around Wrigley Field. 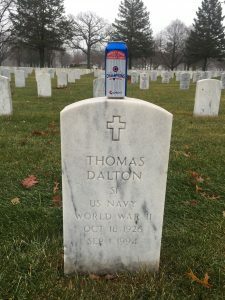 My grandfather is the one that started the Cubsession for our family. He would always go out of his way to watch or listen to the Cubs games while living on the western side of the state in Moline,Il. He would make the 2 hour 30 minute commute 1 way as much as could with friends or on Chartered bus trips to get to Wrigley for an up close and personal view of his slice of heaven. My Grandfather dedicated a room in his house to display all of his collected Cubs memorabilia. You could walk in to the room and listen to him speak about a ticket stub or picture and feel like you where at the game he was describing. Listening to him tell his Cubsessed Cubs stories about an experience he had at a game or getting an opportunity to meet a certain Cubs player at the Cubs Caravan that used to travel the state in 1980’s. It always seemed so magical. Whenever I get a chance to go back through his collection of pictures, cards and memorabilia it brings back so many fond memories. 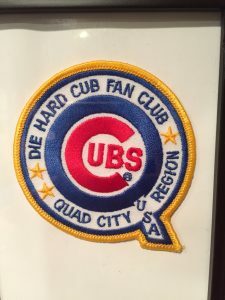 Below is a patch from “Quad City Region Die Hard Cubs Fan Club” that he and so many other fans from the area were members of. 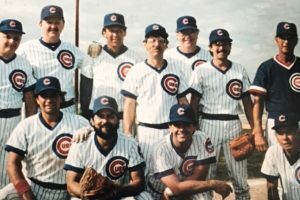 One of my families fondest memories is when he was able to attend the “Cubs Fantasy Camp” hosted by Randy “Rebel” Hundley. For the price of admission you go to play with current and former Chicago Cubs players. 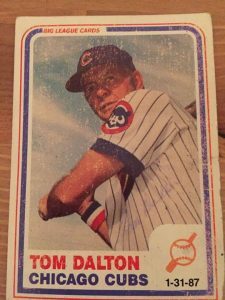 Everyone got a full uniform, Baseball cards like the one you see below, a Cubs bat with your name on it and a chance to rub elbows with the likes of Ernie Banks, Ron Santo, and “Sweet Swinging” Billy Williams. It was an amazing experience for him and something our family will always cherish. I am so thankful to have had the opportunity to grow up aside him not only to enjoy the Glorious victories but to accept the hard defeats as well. Like many Cubsessed Cubs fans who had a Cubs fan mentor who wasn’t able to be around to see them win. It was still the most enjoyable feeling ever knowing that him and all the past Cubs Players and fans were smiling somewhere when they won. I thought about him every day and talked to him every pitch until it they won. His nickname was “Pepsi” so when I found this can with the World Series logo it brought everything full circle for me. 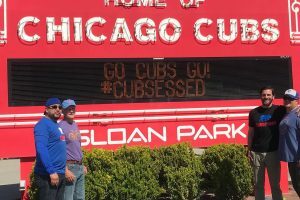 I created this website and social media pages with him and other Cubsessed Cubs fans like us in mind. 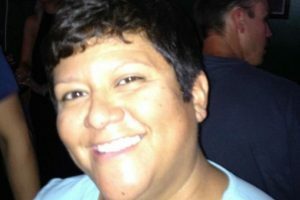 My goal is to share everything happening with the Chicago Cubs through iamcubsessed.com and our other social media outlets. 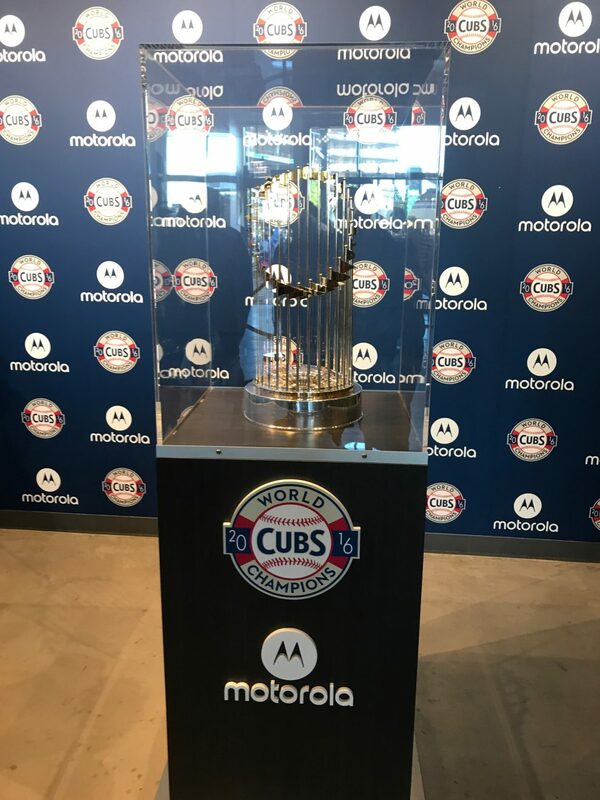 Please share your Cubsessed Cubs experiences by using the submit button to send in your stories and pictures so we can share with other Cubsessed Cubs fans. If you are interested in adding any content consistently by writing Cubs related stories please feel to contact me anytime. I hope you enjoy and, Go Cubs! I’m impressed, I need to say. Truly rarely do I encounter a blog that is both educative and entertaining, and let me let you know, you have got hit the nail on the head. Your notion is outstanding; the concern is some thing that not sufficient men and women are speaking intelligently about. I am very happy that I stumbled across this in my search for one thing relating to this.